Stunning performance from all the cast, it blew my daughter and I away! Can’t wait to go again next year and make more beautiful memories. The staff made the entry & exit very quick as it was extremely busy! A fantastic afternoon for us all, would def go again!! Kids loved it! Simply amazing! Lighting, performances and sounds were great! Interactive with the kids too! "Brought me back to my childhood"
Great experience first time to see the show and would definitely go again. Had great seats n tickets wasn't too expensive either. Courage leads the way, cutting the icy stage for Disney’s most adventurous dreamers at Disney On Ice presents Dream Big. For the first time in Europe, join fearless Moana and the greatest demigod that ever lived, Maui, on an action-packed voyage to restore the stolen heart of Te Fiti, live on ice! Get tangled up in Rapunzel’s hair-raising quest to see the floating lights. Travel to mountainous Arendelle with Anna, Elsa and Olaf in a dramatic retelling of the sisterly love that saved a kingdom. And discover the strength, bravery and kindness that inspired generation after generation with Jasmine, Ariel, Aurora, Belle and Cinderella. Plus, arrive early to join a special 90th birthday celebration in honour of Walt Disney’s ‘True Original,’ Mickey Mouse. 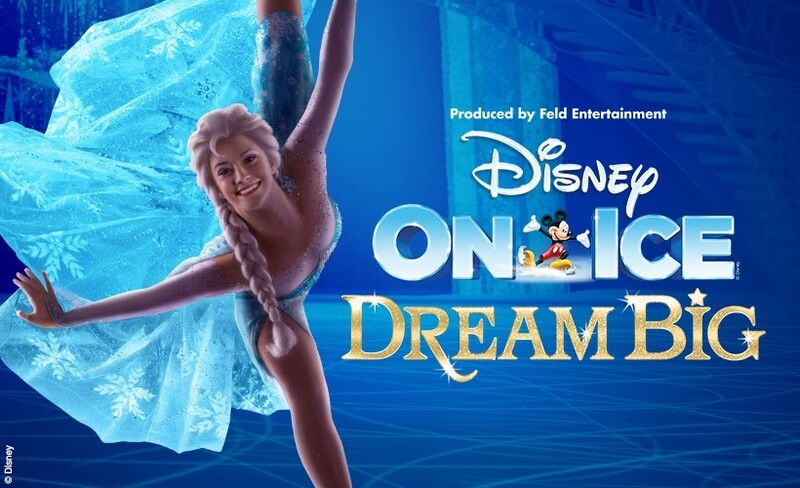 High-flying jumps, breath-taking skating and lovable Disney friends make Disney On Ice presents Dream Big an experience your family will never forget.